Edited to add: I forgot to mention that you can make these in a muffin (or mini muffin) tin if you don’t have a doughnut pan. Everyone can enjoy an almost healthy doughnut! …Yes, you read that title right. These chocolate doughnuts are practically good for you (especially compared to a regular doughnut). They’re baked (not fried) and made with whole wheat flour, a reasonable amount of sugar and no butter, just a little coconut oil. This means no trans fat, only 2 grams of saturated fat, 6 grams of sugar, plus they have whole grains, fiber and come in under 100 calories each! Of course, none of that really matters if they taste like cardboard. But they don’t! I’ve been exploring different flours lately, in an effort to make my excessive baking not quite so unhealthy, and bought white whole wheat flour. It has the same nutritional benefits of whole wheat flour, without the “healthy” taste or texture. So these doughnuts actually just taste like chocolate cake doughnuts. I made a simple sugar glaze to go on top, but they don’t even need it. It did make them a little more moist, but really I just wanted it to stick some sprinkles on them. I couldn’t resist going to Target the day after Valentine’s Day and checking out the 50% off sale. I scored a heart doughnut pan for $5! These doughnuts are actually kind of heart healthy, so it seems pretty apropros. Plus, I got to use my leftover sprinkles from my heart shaped sugar cookies. I can’t wait to make more doughnuts in my new pan! What other doughnut flavors should I try? P.S. Looking for more recipes like this? 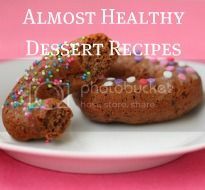 Check out my recipe index for almost healthy desserts! Lightly coat a doughnut tin (or muffin tin) with non-stick spray. Preheat oven to 350℉. In a large bowl, combine flour, cocoa, baking powder, baking soda. Whisk in sugar, nutmeg and salt. Add in the coconut oil and use your fingers to rub it into the dry ingredients until it becomes coarse crumbs. In a separate bowl, mix together buttermilk, yogurt, vanilla and egg. Pour the wet ingredients into the flour mixture and mix until just combined (be careful not to overmix). Use a spoon or piping bag (an easy cheat: use a small ziplock bag and cut a hole in the corner for a makeshift piping bag) to fill each doughnut cup 1/2 to 3/4 full. Bake until doughnuts spring back when touched (between 6-10 minutes, depending on the size of your doughnut pan). Let cool before frosting. *Nutmeg is the key to a recognizable doughnut flavor. You can leave it out, but your doughnuts may taste more like chocolate cake. Love the idea of baked donuts! I haven’t had a donut in years because the fat makes me ill. I think I will try to make these donuts. Since I am trying out all kinds of sugar free recipes I will try to replace the sugar with Splenda. Thanks. @Liz – I hope this recipe works for you and doesn’t make you fill ill. Enjoy! @Trudi – I bought the flour at Target, but most grocery stores should have it too. I’ve never used a doughnut maker but I don’t see why not – it basically bakes the doughnuts so it’s sort of the same idea. Come back and let us know how it works! These look fantastic! I don’t have a doughnut pan but I’ve been making baked “doughnut holes” (mini muffins) like mad – my favorite so far was apple cider. I second the salted caramel idea – that sounds delicious. A baked apple fritter type donut with a glaze would be awesome – or vanilla bean. I’m really tempted to just break down and buy a doughnut pan now! @Jessica – I meant to mention that you can bake these in a muffin tin if you don’t have a doughnut pan – thanks for the reminder! I love apple cider doughnuts so that would be a fun flavor to try next. Salted caramel, apple fritter, the ideas go on…I’ll just have to get started! I just ordered a regular mini doughnut pan that was on sale. Not to be an enabler, but I think you should get one too! I’m not big on unitasker pans and appliances, but this one I’m good with! finally…!! healthy doughnuts, everyone love doughnuts, but many of them don’t realize, how bad that snack would it be for or health, for ppl who know it and conscious about health, they will stop to consume it (like me!) but sometime, the delight of doughnuts couldn’t resist, thank to you, because you can make it healthy! The shape of these doughnuts looks really cute 🙂 It just made me smile. i NEED a doughnut pan. Every time I see a recipe for baked doughnuts I get a tad bit sad. Super cute with the sprinkles! Nicely done! They look so gorgeous and very yummy! Who can argue with almost healthy donuts?? I can’t! Wow, what amazing stats! Hard to believe these are a smart treat 🙂 And I love the heart shape, adorable! Congrats on Top 9, very well deserved. Your heart shaped donuts are adorable, and I love baking with yogurt. I don’t have a doughnut pan, yet:) I can make these in my mini muffin pan though. Congratulations for being Top 9 on Foodbuzz tonight 🙂 I’m bookmarking this recipe now! I can’t believe these are only about 100 calories perfect ~ Thanks for sharing! Congrats on top 9! Cute pic, they look delicious. I am sooo excited (even though I saw your note at the top). I just bought my first doughnut pan and am itching like crazy to test it out! The idea of an almost healthy doughnut has me pumped! I am gonna try this recipe right now.where did you buy the muffin/donut pan? @Kitty – I got it at Target around Valentine’s Day. I think they have similar pans that are round instead of hearts year round.